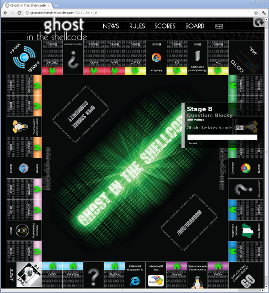 The Ghost In The Shellcode competition had a really cool challenge in the RE category called Blocky. It's a minecraft world where the game elements are used to perform a bitwise function on the input and compare the output to a fixed value. The correct input (inverse) is the "launch code" as requested by the level. My friend Scott has written an insane guide on how to extract the circuit from the game, and how to solve it using linear algebra. His complete writeup is here and a slightly abridged version follows below. Then we'll solve it a second way by converting the circuit to a SAT instance and solving it with picosat. First, modify the world to be in Creative mode. Now it's trivially easy to add or remove any type of block from the world. I stripped away the north half of the building so I could fly straight down to the switches, and I also removed the entire TNT cannon since it was covering the "signal bus" coming straight from the switches. Also, I removed the tamper-resistance line just because I didn't want it confusing me as I traced out the circuit. But the most important reason to be in Creative mode is so that you can easily label your traces without having to acquire resources to make colored wool or whatever you use for your labeling scheme. 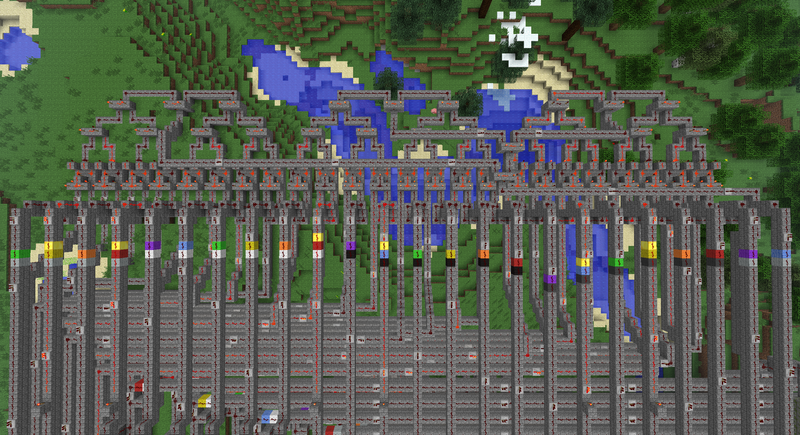 Circuits are made using Redstone Powder (often just called Redstone), Redstone Torches, Redstone Repeaters, and Switches. See this wiki link for more information. Redstone Powder, or just Redstone, is the "current carrying" element, the wiring. Redstone Torches (not to be confused with normal Torches) can power Redstone circuits. They burn indefinitely. They can also be switched on or off if they are mounted on top of or on the side of a block. This creates an inverter. Switches and Redstone torches can only power a Redstone circuit for a distance of 15 blocks. Redstone Repeaters are like line buffers that will retransmit their input signal, allowing you to carry a circuit indefinitely as long as you space repeaters every 16 blocks or closer. Also, like electrical line buffers, they are unidirectional -- they act like diodes, passing the signal only in the direction of their "arrow". 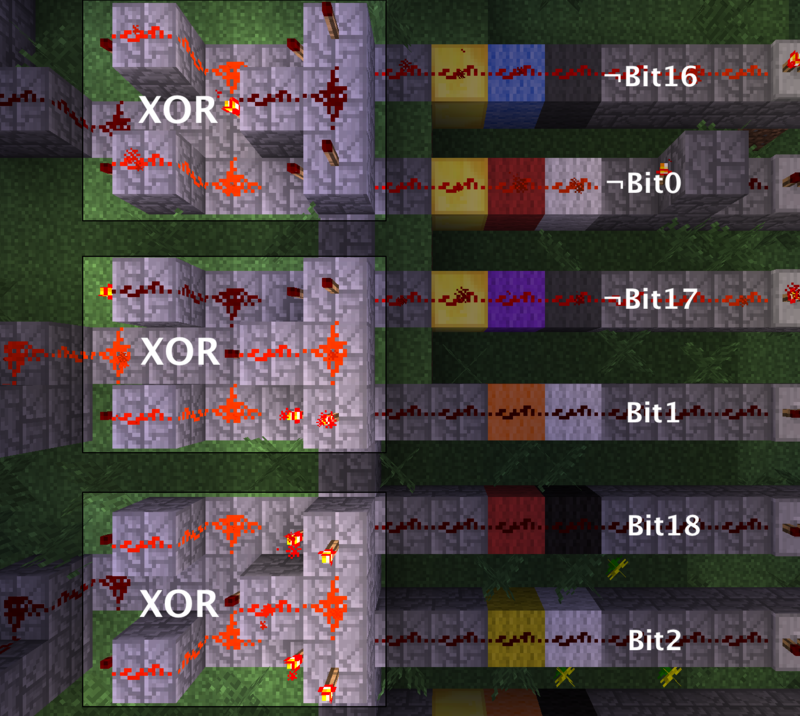 Redstone Repeaters are also configurable delay elements. This behavior is not used in this circuit. I used colored wool blocks to come up with a color code for the circuit traces. 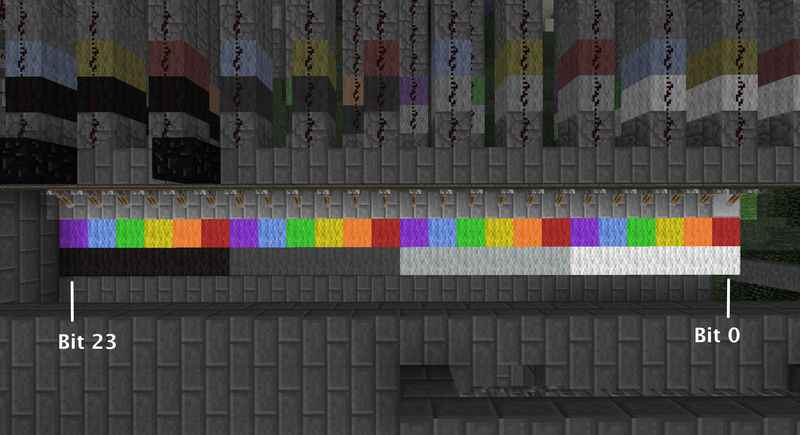 The 4 gray-scale wool blocks (white, light-gray, dark-gray, and black) grouped 6 bits, and each line in the groups were denoted by Red, Orange, Yellow, Green, Blue, and Purple. I also found it helpful to use another visually distinctive block (such as Gold) to label a line that had been inverted prior to entering a logic gate. In my "colored wool" notation, Switch 'Bit 0' is White-Red, down to 'Bit 23' = Black-Purple. First I labeled all the switches, then I traced out every line to the input of a logic gate. I followed all branches of the switch lines. I didn't bother labeling the outputs of logic gates because they were much easier to follow as busses than the input lines were. If you fly up high and look down at the circuit, you'll see that the West side is 24 XOR gates, with their outputs being bussed together quite nicely North, along the Northern edge of the circuit, and then fanned out nicely to the gates on the East side. 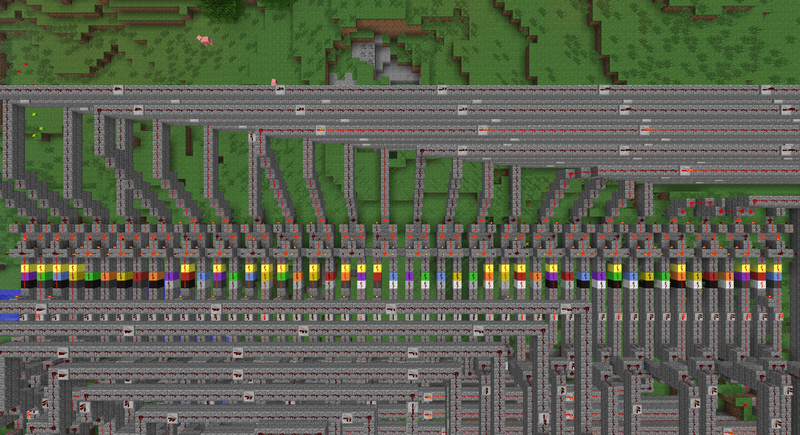 The East side is a collection of another 24 XOR gates, whose outputs are pairwise AND'ed together to a single line, the one that fires the TNT cannon. where "a ^ b" is the West side XOR group, which is XOR'ed with c on the East side. a, b, and c are some unknown functions of the input word (switches). Starting on the West side XOR group, I chose the Southern-input (left, if you're looking at the input side of the gate) as "a", and the Northern (right) input as "b". Starting at the Northern-most end, you see ! "White-Red" ^ ! "DarkGray-Blue" (where '!' denotes NOT). That's !Bit0 ^ !Bit16. Moving over South to the next XOR gate, you see "White-Orange" ^ ! "DarkGray-Purple", or Bit1 ^ !Bit17. Collecting up the Gold block constants (where Gold blocks are 1, and no Gold block is 0), we find P = 0xC7F101 and Q = 0xC123AB. This looks promising. 0xC7F101... "CTF 101"... and 0xC123AB is just 0xABC123 left-rotated by 8 bits. We're on the right track. Movin' on up to the East side (to a deluxe apartment in the sky... sorry), we see the bus of lines from the West side XOR gates fans back out in an orderly fashion without any more bit rotations or inverters (NOT gates), into the North input of each East side XOR gate. 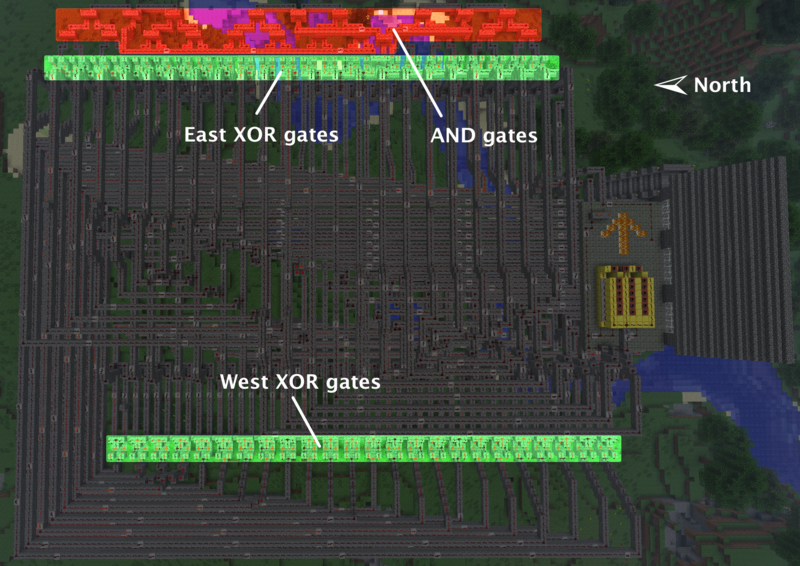 So only the Southern (right) inputs of the East XOR gates have any inversions. Looking at Southern-most XOR gate on the East side, we see "LightGray-Blue" ^ [the output of the Northern-most West side XOR gate]. "LightGray-Blue" corresponds to Bit10, and after verifying the color pattern, we see that the East side XOR gates are just [West side XOR outputs] ^ rotl24(x, 14) (again, ignoring the NOTs on the rotated inputs). Collecting the XOR-mask bits, we find R = 0x505050. That looks like a sensible sentinel value, so let's assume we're still tracking correctly. Solve for x, set the switches correspondingly, and light the TNT cannon up. A simple brute-force solver yields x = 0x37A8D8; this is the only value of x that will fire the cannon. Observation: All of the even-order bits of the output are dependent upon only even-order bits of the input. In our equation, only the even-order bits keep to themselves, and the odd-order bits mingle with their own kind. This means that this 24-bit tranformation from x to y is functionally identical to interleaving (Mortonizing) the 12-bit transformation f' : x' -> y' = x' ^ rotl12(x', 4) ^ rotl12(x', 7) when applied separately to the even-order bits and the odd-order bits of the original 24-bit space. Thus, this isn't really a 24-bit problem at all. It's a 12-bit problem, just applied to two input values (that happen to be the de-interleaved bits of x), producing two output values and interleaving them to produce a 24-bit Morton number. If this were a 64-bit key we were looking for, reducing the problem to solving it for two 32-bit numbers would be critical to brute-forcing the answer within the timeframe of a CTF competition. As it is, 24 bits takes a fraction of a second to brute force. So it's interesting, but not necessary for solving. 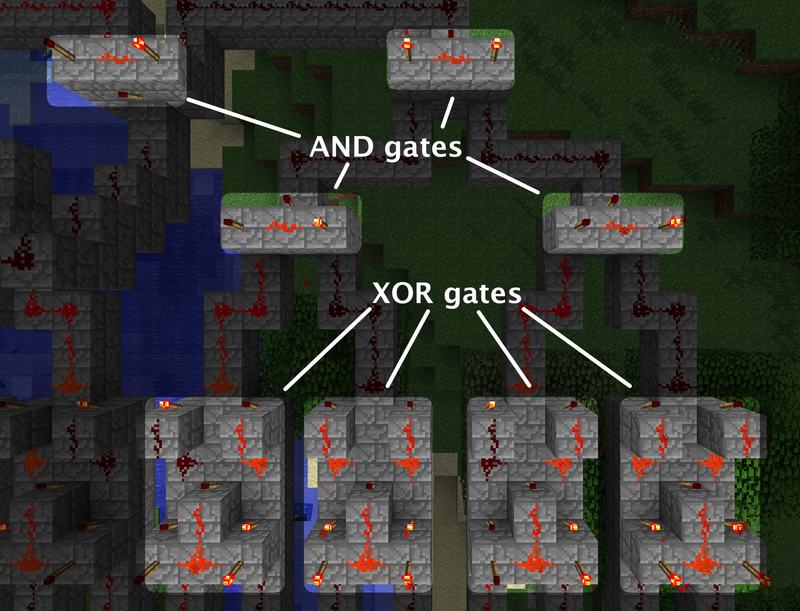 Now for every gate is introduced a new variable representing its output. Then a precomputed CNF is substituted that evaluates to true when the gate is operating properly. This is called the Tseitin transformation and I threw up a description and a small example on Wikipedia. The new formula is equisatisfiable and has more variables the the original, but its length has grown linearly compared to the input formula, vs using De-Morgan and distribution laws which can have exponential expansion of the input formula. The final "top output" of each new circuit can then be placed in its own clause (possibly complemented) to aim it at a particular output. Ordering the bits to get 001101111010100011011000. Separate the nibbles to get 0011-0111-1010-1000-1101-1000. Convert to hex to get 0x37A8D8. I've loved digital logic ever since EEL3701 so reading about what Scott found in this challenge and seeing his screenshots really got me excited. SAT solving is something I've been reading and learning about recently and this was the perfect opportunity to put that nascent knowledge to the test.